A novel, fast and reliable procedure for acoustic certification of new rolling stock. ACOUTRAIN (Virtual certification of acoustic performance for freight and passenger trains) was an EU FP7 project that aimed to simplify and improve the acoustic certification process of new rolling stock. New rail vehicles currently have to be tested according to the TSI Noise. These tests are expensive and time consuming. 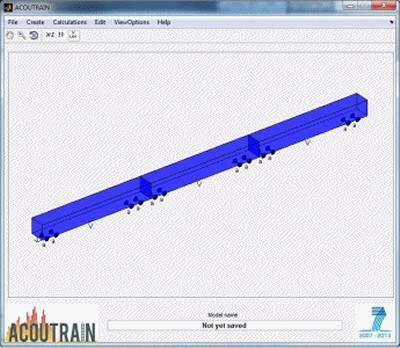 The goal of ACOUTRAIN was to speed up the authorization process by introducing some elements of virtual testing while retaining the same degree of reliability and accuracy. Railway noise is an environmental issue that significantly affects the population along railway lines. This is a well-recognized problem at European level and in recent years EU regulations, including so-called TSIs (Technical Specifications for Interoperability), have come into force to reduce the noise impact. The TSI Noise introduces limit values for the noise emitted by individual vehicles and is therefore an important instrument for reducing environmental noise levels in Europe. By gradually introducing lower limit levels in the TSI Noise, the supply industry is put under pressure to develop quieter products. Additionally the TSI Noise, in common with the whole TSI portfolio, is intended to promote interoperability: once a vehicle is authorized in one country this is sufficient to allow operation over the whole Trans-European Network. This sounds appealing but, in reality, the TSI Noise conformity assessment process has introduced a layer of complexity and rigidity that limits its benefits. The testing process required for new railway vehicles according to the TSI requirements is too time consuming and costly. ACOUTRAIN aimed to address this by introducing the possibility of simulation to replace part of the noise testing procedures. ISVR was a lead partner in ACOUTRAIN and a member of the technical management team. We contributd to all the technical work-packages and led the one on rolling noise sources. In particular, as a research partner, we were asked to improve the existing models for rolling noise and we were developing hybrid method for characterising aerodynamic noise from bogie and pantograph. An important ISVR contribution was the development of a new software for efficiently predicting standstill and pass-by noise for a defined set of noise sources on the train. Squicciarini, G., Toward, M. G. R., Jones, C. J. C., & Thompson, D. J. (2013). Statistical description of wheel roughness. Paper presented at 11th International Workshop on Railway Noise (IWRN), Sweden. Jansen, H. W., Dittrich, M. G., Squicciarini, G., Thompson, D. J., & Betgen, B. (2013). Transposition of noise type test data for tracks and vehicles. Paper presented at 11th International Workshop on Railway Noise (IWRN), Sweden.